When he arrives on Neal's Island to begin ten days of intensive group therapy to treat his obsession for a woman he cannot forget, he brings with him the pseudonym of Bloodworth. Pseudonyms are a requirement to participate in Dr. Carson X. Willingham's unconventional and often bizarre seminars--a deliberate lie to inspire the search for a needed truth. What he discovers is an island of ghosts, an island of intense, but fragile, relationships founded on deceit, and, yet, an island strangely harboring the yearned-for promise of healing. The same is true for Barkeep, Menlo, Max, and Godsick--his fellow members in the seminar, each with his own pseudonym and each suffering his own agony because of a relationship with a woman. Vastly different as individuals, yet suffering the same crippling malady of obsession, the five are not prepared for the antics of Carson X. Willingham. He is maverick and madman, a brilliant investigator of his subjects, a mesmerizing performer, and either a genius or a charlatan with a rare gift of persuasion. Willingham is also a man with his own demons, caused by his own history of obsession. It is in this environment that Bloodworth finds himself faced with the delicate question of honesty as he tries to free the memory of his Kalee, and begin his new journey into the uncertainty of what might be. This book also available in e-book format through Amazon, Barnes and Noble, and Kobo. In his Song of the Vagabond Bird, Terry Kay writes with the magical realism of Gabriel Garcia Marquez, of dreams and ghosts, of this world and the next, and how the reefs of the mind protect the islands of the heart. He reveals the infinite varieties of pain that go with loving a woman, especially a good woman. Women, read and learn. Men, read and remember. All the passion, ecstasy, and joy of love won—and all the angst, pain, and sorrow of love lost—are deftly woven together in Terry Kay’s masterful story of five men on an island. 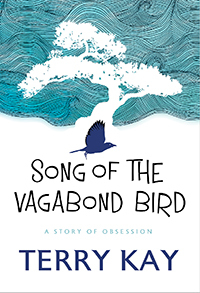 Each there to heal a broken heart, they seek redemption in their common bond through the quixotic therapy of the charismatic Dr. Carson X. Kay’s Song of the Vagabond Bird is a stunning encounter, simply an unforgettable experience for all who have ever fallen in love. The author who explored the challenges of growing old for his parents’ generation (To Dance with the White Dog ) now explores the way men of his own generation survive the women they have met, loved, and lost. In novel after bittersweet novel, Terry Kay places no boundaries on his fictional landscape, and this one has ghosts, a Svengali counselor, and five men who strive to rebound. If this literary novel, filmic as it is, were to be pitched to Hollywood (and it should be) the tag would read: Wuthering Heights meets The Master. Imagine Heathcliff on an island. Terry Kay takes readers on an entertaining, thought-provoking journey—one that is ultimately about healing joy after long suffering, and acceptance. A writer not confined by a genre, Kay once again proves himself to be another sort of vagabond bird, as well as a master storyteller.